At Thanksgiving and Always, We’re Super Grateful—For You! Salon Success Academy wants to wish our entire extended family—students, instructors, staff, graduates—a very Happy Thanksgiving. Founded more than 50 years ago as a “people helping” company, we’re proud to have passionate people attend our school and also to work with our students to help them reach their potential. I have a passion for life. In today’s world we first have to love ourselves to help spread the love to the people we surround ourselves with every day. I’m thankful for my family, friends, co-workers and my students. I find the passion and love within myself to help these young minds I try to inspire and mentor every day. My greatest gratitude is seeing my students grow in their life and find their passion for their future. My biggest reward I get from them is seeing them succeed and not give up. I try to inspire my students every day and always, even after graduation day, to make sure their career, passion and love always stays within them. I am thankful for every day I wake up and draw breath. There are people all over the world who didn’t have that opportunity today. None of us know if the sun will rise for us or the ones we love tomorrow. We need to treat every day as a gift. At every Thanksgiving dinner my family takes a few minutes to remember our family and friends who aren’t with us this year. Sometimes the wounds are fresh. There is an empty seat at the table and we shed some tears in remembrance, for others it’s a time to think about holidays past and all of the love and great times we had together. My family is everything to me. Without them nothing else matters. I am grateful for my loving parents, my sisters, my husband and best friend for the past 33 years, and our two amazing children. I want to wish everyone a Happy Thanksgiving. I hope your holidays are filled with love, laughter and good times with family and friends. Make happy memories. 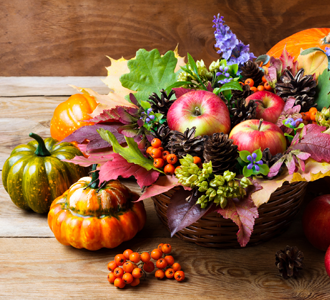 From all of us at Salon Success Academy, Happy Thanksgiving! What are you thankful for?